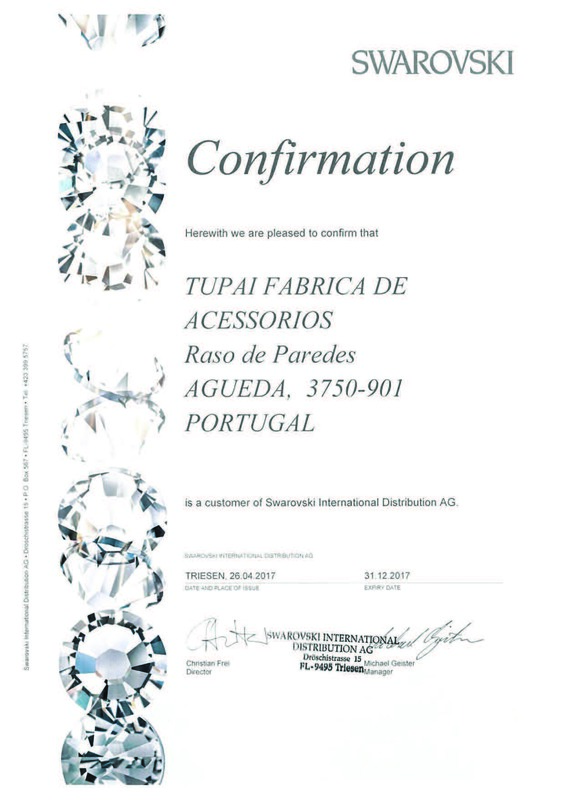 TUPAI, established in 1976 is a company that operates in the metalworking sector, adopting as guiding lines the Reliability in the relationship with its partners, Rigor in the commitments and Respect for the legal and environmental norms. With the Mission of being a global company that involves people and partners in the continuous search of success, TUPAI is an Organization that combines the knowledge of generations with the professionalism and good management practice. 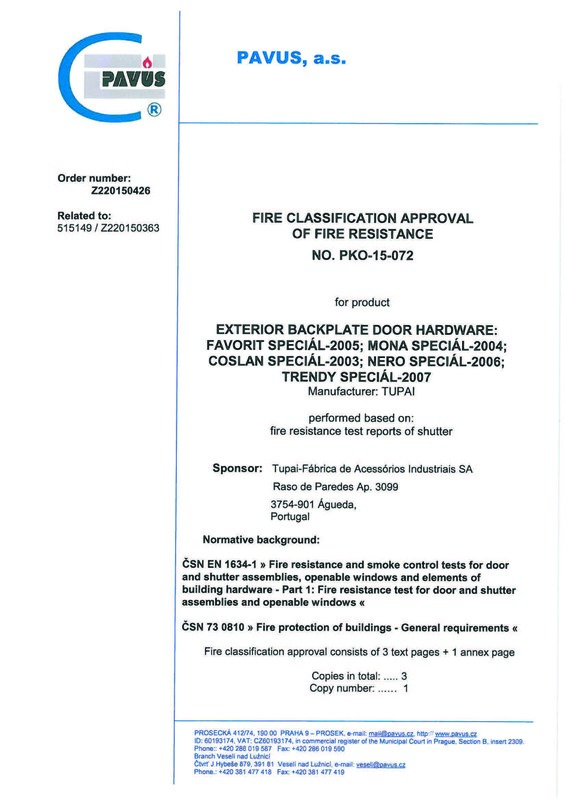 For more than 40 years It has extended its presence in Portugal and in several countries around the world, operating in two different business segments, the standard products of its catalogue (hardware for building construction) and OEM products (according to customer specification). As a manufacturing industry, TUPAI gets its products from 3 raw materials, brass, zamak and stainless, developing its productive processes (in an integrated way), from the brass forging, brass and zamak injection to the cold and laser cut, subjected to high technology in the surfaces polishing, with robotic processes, combined with manual processes, assuring high quality standards by using rigorous galvanic processes, which enable to provide more than 150 colors and finishings. 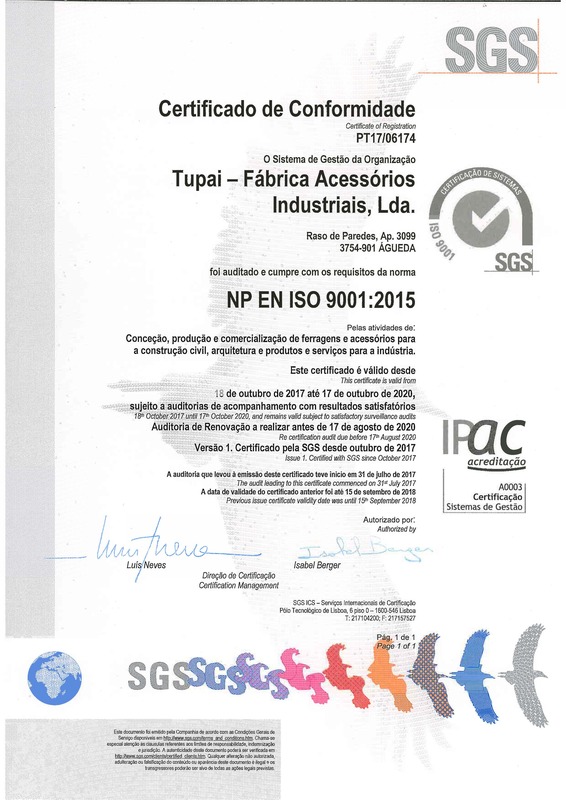 TUPAI is certified by the Norms ISO 9001-2015 and ISO 14001-2015, and the compliance of the legal and environmental requirements is a permanent concern, assuming also an important role in social level. 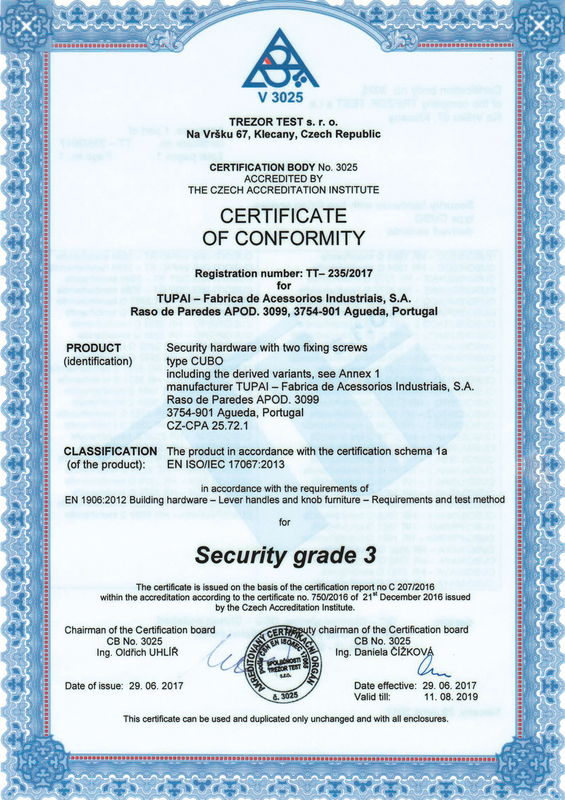 TUPAI is now a reference brand together the architects, designers, distributors, installers and final consumers. By investing heavily in the design of the original authors, the Tupai leads the way for exclusive designs and supplies a wide range of metal accessories and hardware quality and design recognized. Their advanced technological features, the result of continuous investments in manufacturing process, allow the production of high quality and numerous tests to permanently control during the different stages of manufacture, are assured that quality. 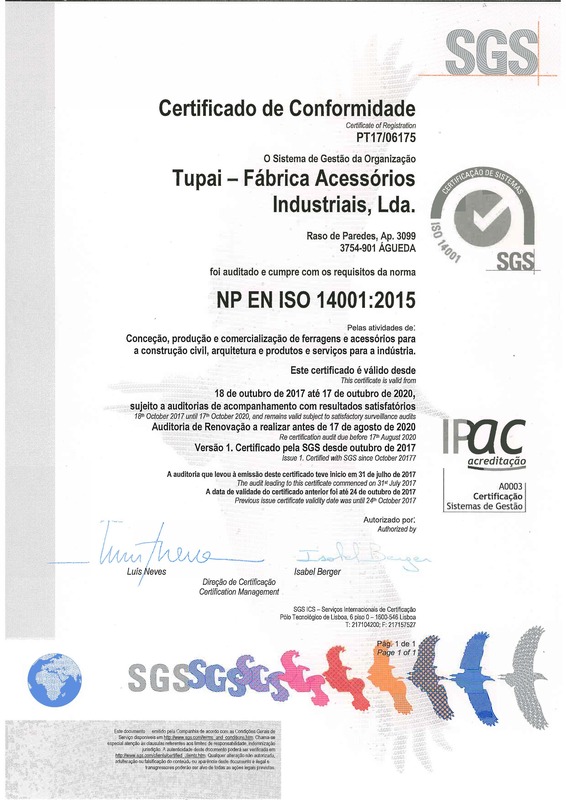 The quality certification by the NP EN ISO 9001:2008 is a reference care having regard to the requirements of customers and environmental licensing NP EN ISO 14001:2004, having been the first Portuguese company in this sector to get it confers Tupai to a high sense of responsibility towards the environment. Specializes in the production and finishing of metal products (brass, zamak and steel), notes the strong growth of industrial capacity and diversity of production processes. Ability to control the entire production process, from the raw material to the final product. The cold forging and stamping, injection, machining, vibration, sanding, polishing and Plating are the confidence with which the Tupai is presented to the market. The Integrated Management system is implemented in the design, production and commercialization of fittings and accessories for civil construction, architecture and products and services for the industry, according to the requirements of the standards NP EN ISO 9001 and NP EN ISO14001.